Teacups and saucers are kind of like socks orphaned by the dryer which remain in the sock drawer long after their mate’s demise. When a teacup breaks the now orphaned saucer remains in the pile in the cupboard in the kitchen, at least that's what we do. Maybe it’s a memento of the set. Like my favourite cup and saucer, a Queen Anne Fine Bone China with pink dandelions (crepis incana). At one point we had two of these, then one and finally now just two saucers. When it broke I was inconsolable as I had been drinking tea from it for 50 years. Tea is an important part of our weekly ritual. I visit my mom on the weekend and we always have a cup in the late afternoon. The Murchie Tea Company in Vancouver has been supplying the family brew since 1920 something. However, if you have nothing else to do on a cold January day then please read on!). 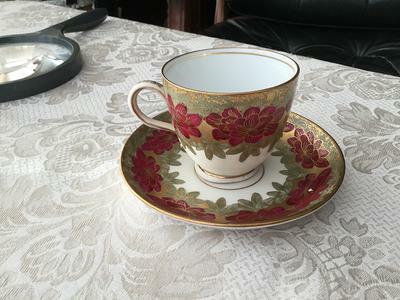 This whole thing started at lunch today when I commented to my mother that we might be able to find some teacups to match the orphaned saucers by searching on-line. 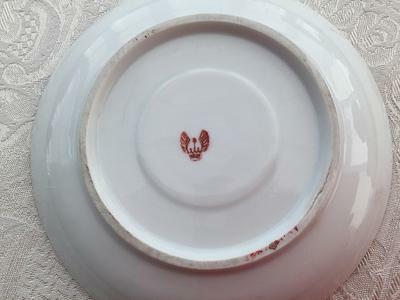 One cup and saucer set only had a mark on the base, no words or other distinguishing marks. Mom (who is now 94) acquired the cup and saucer along with others from her mother who had inherited them from her aunt Zina. Great aunt Zina was born Ameliasburg in Prince Edward County, Ontario, Canada, in 1869 to Mary Emily and Marshall Johnstone who owned the flour mill. After Marshall Johnstone died in 1895, Mary Emily sold the mill and took the four girls to Brandon, Manitoba - we don't know why she picked Brandon. but only a few of her large collection survive. One Staffordshire, some Minton, and a lovely Coalport cup and saucer with an Indian tree pattern and the number 14J18 on the saucer. To the matter at hand. We have tried using a Google Image search to see if the algorithm can find any matches to the mark. The results were beaded jewelry and then, when refined, teacup pigs in pink clothing – no I’m not kidding, this is the internet after all. 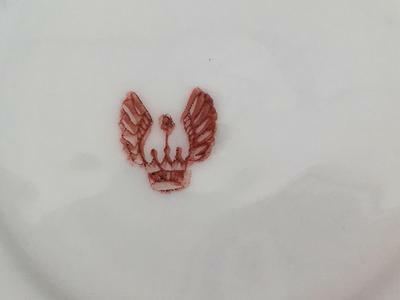 Then I went to typing in a description of the mark, “china makers mark crown with wings” and got lots of results one of which was a resource of marks but got tired after page 16 of countless pages and with no way to refine our search we went back to Google. Finally we came upon this website and thought we would ask for help! It is frustrating not to have a language to describe the mark. 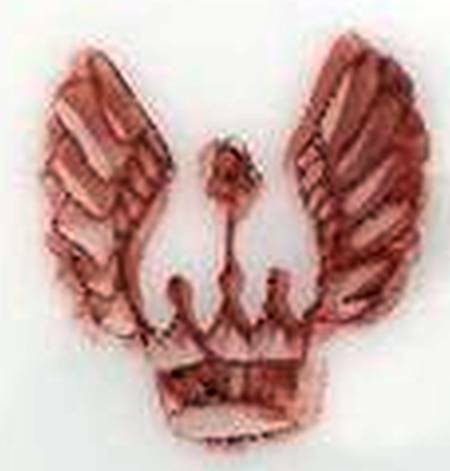 Raised wings on a 5 pointed crown with something in the middle – a rose perhaps – does not help. This whole world is new to us and we are hoping that someone will recognize it. Not concerned about finding a lost treasure or a valuable antique, just very curious to find out where this comes from and when. A story to tell the great grands when they come for tea with Mom. Lovely piece of writing. You have a talent. Thanks for the family background - loved reading your piece, laconic, loose and lush with detail. Thanks for 'getting' what this website is about. This mark is unknown to me currently. I have never seen it before and at the moment can't find it any references. It's a very characteristic mark and one you won't forget too easily. Let's hope we have some luck in others posting. If people have the same mark at least we'll know how widespread this mark is. Thanks so much for the comments and for researching the mark. 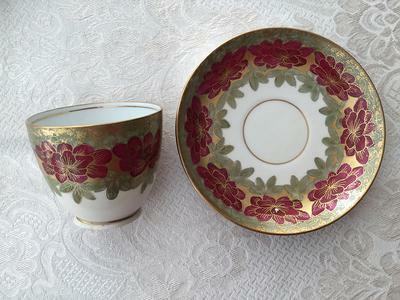 We are looking forward to seeing if anyone can help figure out where this cup and saucer come from. Has anyone ever identified the mark? two inkwells identical to those described above with a small matching fairly flat dish. I have also have a piece with the winged crown mark and I believe its Asian most likely Japanese. It is not British China. I have a dish with the same mark. It says Made in Austria.